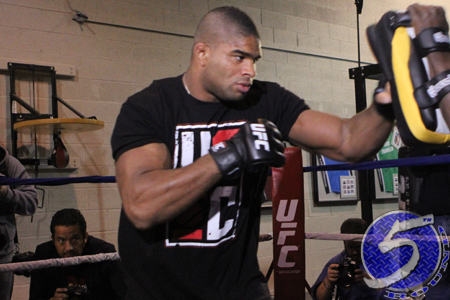 Somebody get Alistair Overeem (pictured) some horse meat, STAT! The heavyweight’s brief run in the UFC has been a disappointing one, to put it mildly. Some might say, Overeem is overrated. After blasting out of the gates with an impressive victory over former UFC champ Brock Lesnar, Overeem was hit with a nine-month testosterone suspension which took him out of a title fight against then-champ Junior dos Santos. The kickboxer returned from his ban and hasn’t looked the same – with his fight game or physically (not as Ubereem as before). “The Demolition Man” got demolished by Antonio “Bigfoot” Silva and Saturday night to Travis Browne. Against both fighters, Overeem was a heavy odds-on favorite and was viciously put down in lights out fashion. Following Overeem’s latest loss, UFC president Dana White isn’t sure what the future holds for the Dutchman. “You guys, especially (in the media), all believed he was the best at one time,” White said of Overeem. “He had a big following. When asked pointblank if Overeem would be back in the UFC, White refused to give a definitive answer. Overeem made $264,285 (with roughly half of his paycheck coming via win bonus) for beating Lesnar and $285,714 in his loss to Bigfoot.